Achyutananda Kar, eminent satirist, critic and founder editor of popular satirical magazine “Durmukha” died on Sunday night after a prolonged illness. The 80-year-old was undergoing treatment at the SCB Medical College Hospital where he breathed his last. He is survived by wife Sailabala, two sons and a daughter. The mortal remains of Kar was consigned to flames at the Swargadham crematorium here at Khannagar on Monday afternoon. Eminent people, including writers, critics and journalists, paid glowing tributes to Kar, who had earned fame as a litterateur, journalist and a spiritual orator. His satirical write-ups involving social, economic, and, more particularly, on political topics in Durmukha were highly popular. His books ‘Ita cement ra Punjibad’, ‘Katha Katha Re’, ‘Pandita Achyutanka Byanga’, ‘Sangram O Sangharsha’, ‘Dake Durmukha’ and ‘Beaieen Manisha,’ became examples of satirical literature in the State. Born to Kanduri Dasa and Mauna Devi at Tarjang village under Bari Derabis of Kendrapara district, Kar had shown cultural and literary inclinations from a very young age. 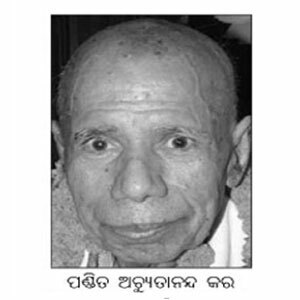 He was associated with the Akashvani, Cuttack, as an artiste from 1960. His death has been mourned by Governor MC Bhandare and Chief Minister Naveen Patnaik. “He has set remarkable benchmarks for young writers to follow. His writings resulted in positive impact on the society,” Naveen said in a statement.